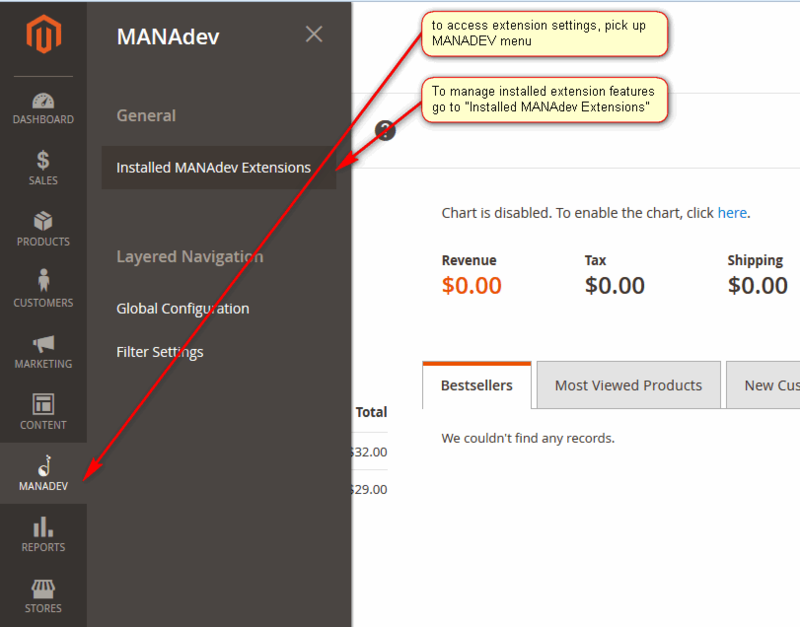 In order to access extension settings, pick up MANADEV menu on the left sidebar. You can view and manage extension statuses globally - for all websites and stores. In this case select All Store Views in Store View drop down menu. Extensions and features can be enabled or disabled for specific websites or stores. To do this first select store or website in Store View drop down menu. To enable or disable extension or extension feature choose proper Status column value. Sometimes instead of extension uninstalling it is enough just to disable it. This is especially useful if different store views requires different confiiguration of installed Magento extensions. After configuration change it is recommended to refresh Magento cache in SYSTEM -> Cache Management. Easy way to check if newest MANAdev extension versions exists. Just press the button Check for updates. If new version exists, login to your MANdev account and download new version.